When you blink your eyes, you never know what you’ll see next. I can attest. Once I was with friends, driving to see the spring jonquils at Wye Mountain. Margery was the driver and I sat beside her in the front seat. The whole group of us had stayed up late the night before, visiting, and I was so tired I could hardly keep my eyes open. In fact, I let my eyelids fall… and close… for a second… or two. When I opened them, the road had shifted—astounding!—and we were driving down the wrong side of it! Margery’s eyes had closed in tandem with mine; we had both blinked. And the world could have changed much more dramatically than it did. I’ve told you that story as a lead-in to sharing what just happened at the local boat ramp. Don’t worry, nobody got hurt.. This entry was posted in Life and tagged Arkansas, Fun, Walking on May 30, 2015 by wayaclan. On this windy but mellow afternoon, I walked the extra distance to Hickory Creek Park and was rewarded with beautiful scenes and intriguing finds. For example, a certain type of tree caught my eye because it had retained most of its blade-shaped leaves, which were still green shifting to yellow. 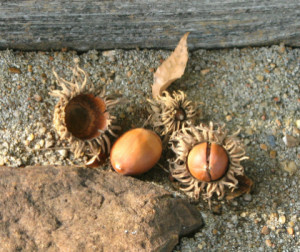 Upon investigation, I found a profusion of large, unusually-capped acorns on the ground beneath the tree. Many had fallen to some nearby pavement or among the rocks and gravel that edge it. This entry was posted in Nature and tagged Arkansas, Beauty, Nature, Seasons, Walking on November 16, 2013 by wayaclan. I put my mother to work again, meaning the doll that my niece Valerie made for me. 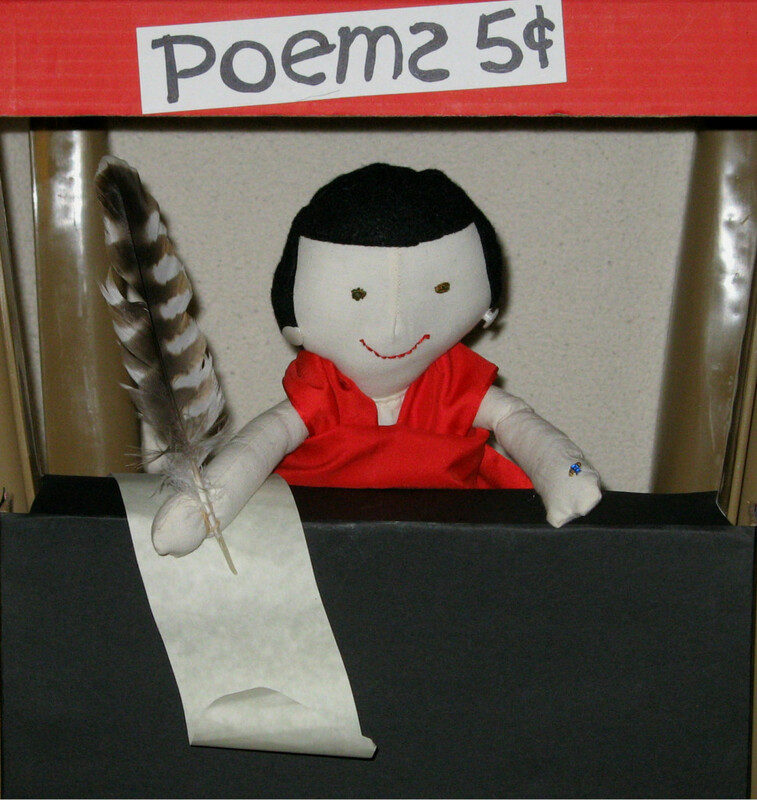 Once again, she manned a small poems-for-sale booth (designed to resemble Lucy’s in the Peanuts cartoon strip). This time the booth related to an Arkansas Authors event at the Springdale Public Library. For several hours Saturday afternoon, I promoted my writing and my poetry group, Poets Northwest. About 40 authors participated, each with table display space. It was my pleasure to share “fortune cookie” poems with visitors and fellow authors. A poem overture is a good icebreaker to further conversation. 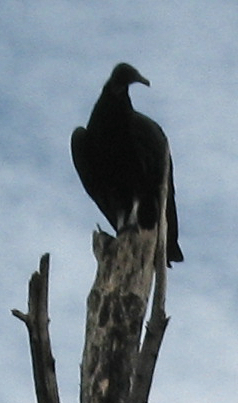 This entry was posted in Life and tagged Animals, Arkansas, Poetry, Walking on October 7, 2013 by wayaclan. This entry was posted in Life and tagged Arkansas, Beauty, Poetry, Walking on September 25, 2013 by wayaclan. Amazingly, thankfully, the verdure brought by early August rains still graces the scenery of my daily walks. 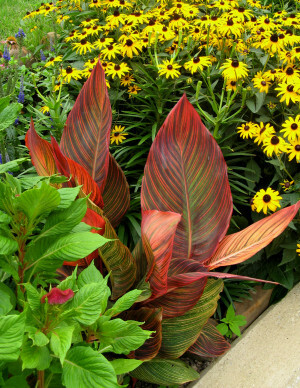 The woods remain extra-green and neighbors’ flower plantings are full and lush. 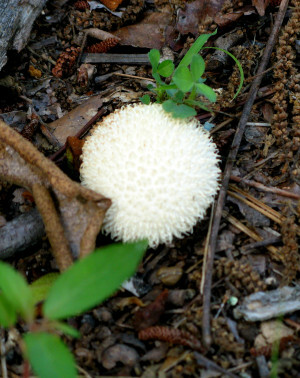 Mushrooms continue to appear, puff up, brown, and die away. Some varieties are especially beautiful; this globe-shaped one is reminiscent of an anemone on a sea-floor. 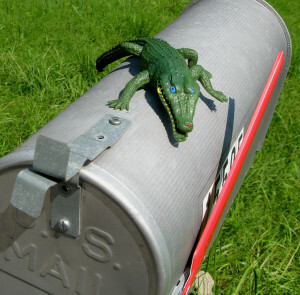 The only known fact about the gator’s arrival is that it materialized on the asphalt by our mailbox one morning. I had no idea what to do with it. Eventually, I decided to move it to the top of the mailbox, partly to witness Ethan’s reaction when he gathered in the noon mail. His reaction, if any, was imperceptible—probably because so many strange events occur in our lives anyway. Strange or not, I addressed the alligator in a poem. lounging smugger than a toad. I saw that he was rubberized. “Gator, are you someone’s toy? 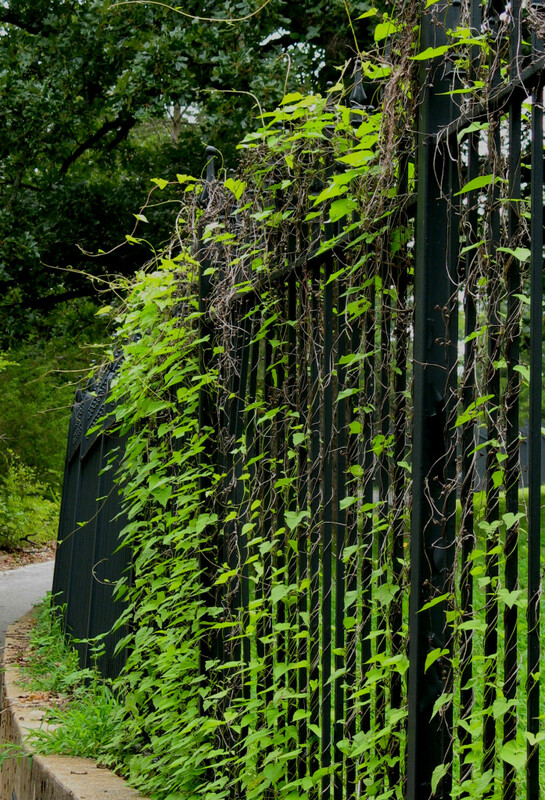 One of the prettiest sights recently is this view of vines at a retaining wall railing. Opposite the railing and slanting down the hill slope is the view that appears at the top of today’s blog post. I feel very fortunate to live near such beauty and to be fit enough for daily excursions. Every place has its own beauty … how is it where you live? 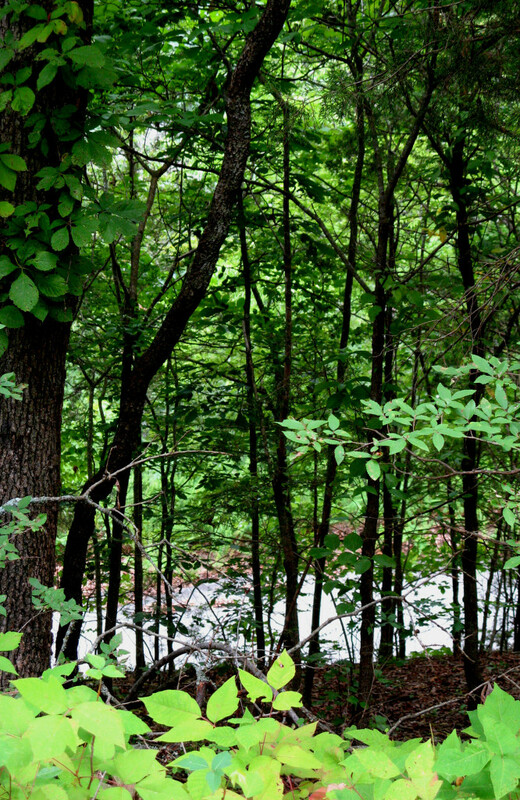 This entry was posted in Life, Nature and tagged Arkansas, Beauty, Nature, Poetry on August 28, 2013 by wayaclan.